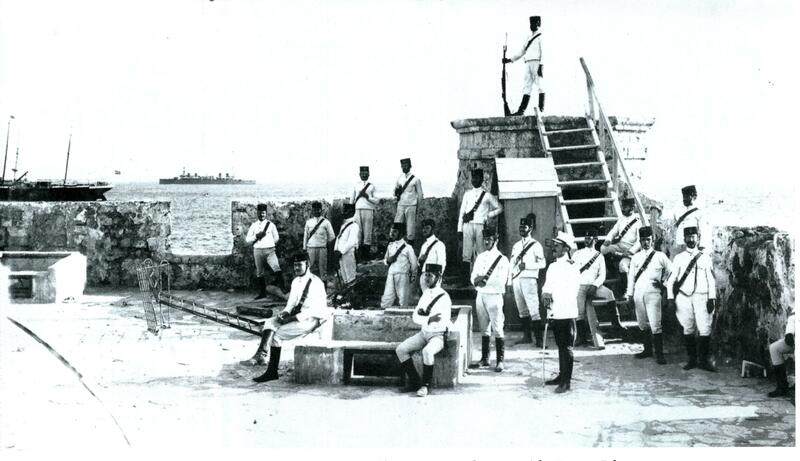 Royal Navy in Crete | The British in Crete, 1896 to 1913. HMS Bruizer and the blockade runner. In early February 1897 the Cretan crisis came to a head. With the dispatch of Colonel Vassos and 1500 Greek soldiers to Crete, the firing by the Greek navy on the Ottoman steamer Fuad, en route from Canea to Sitia with troops and gendarmes, and the imminent arrival in Cretan waters of a Greek torpedo boat squadron under Prince George of Greece, the Powers determined to act to prevent the Greek annexation of the island. On 13 February 1897 the Admiralty issued instructions to Rear-Admiral Harris, Senior British naval officer off Crete, that, if the commanders of the European ships in Cretan waters were in agreement, the Royal Navy could, ‘oppose by combined action, if necessary, and after employing all means of persuasion and intimidation in their power, an aggressive action by Greek ships of war.’ This combined action was interpreted to include the prevention of any further build up of Greek forces on the island. 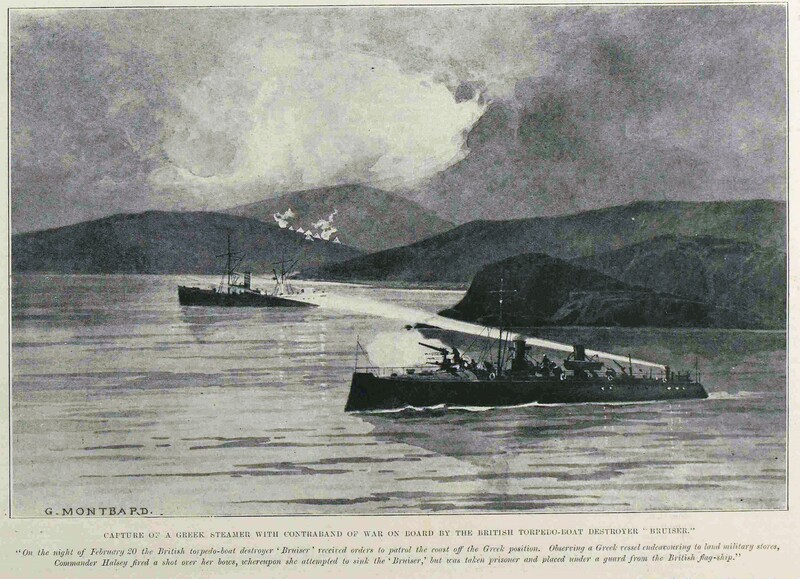 ‘…to act under the orders of Rear-Admiral Gualterio [Italian navy] who was watching the western end of Canea Bay in the “Francesco Morosini” on the evening of 20 February to prevent disembarkation of troops, stores &c.
The “Bruizer” observed a steamer creeping up under the land, and accordingly made a preconceived signal to the “Morosini,” who closed, and ordered the vessel to heave-to. The Read-Admiral sent an officer to the “Bruizer” with the request that the vessel might be taken by her to Canea; in the meanwhile, the steamer went ahead and apparently attempted to run down the “Bruizer,” which would have inevitably sunk her. By going full speed astern this was just avoided, and the ship attempted to run. Having speed up for only 10 knots, and the steamer going about 14, the Lieutenant and Commander Halsey fired under her stern, when she stopped. She was then convoyed round to Canea Bay by the “Bruizer,” and a guard placed on board. She was found to contain 300 tents and poles, empty rifle chests, a few rifles and a small quantity of biscuit; examination subsequently proved that a large quantity of biscuit had been recently landed, and the empty arm chests had probably been cleared at the same time. 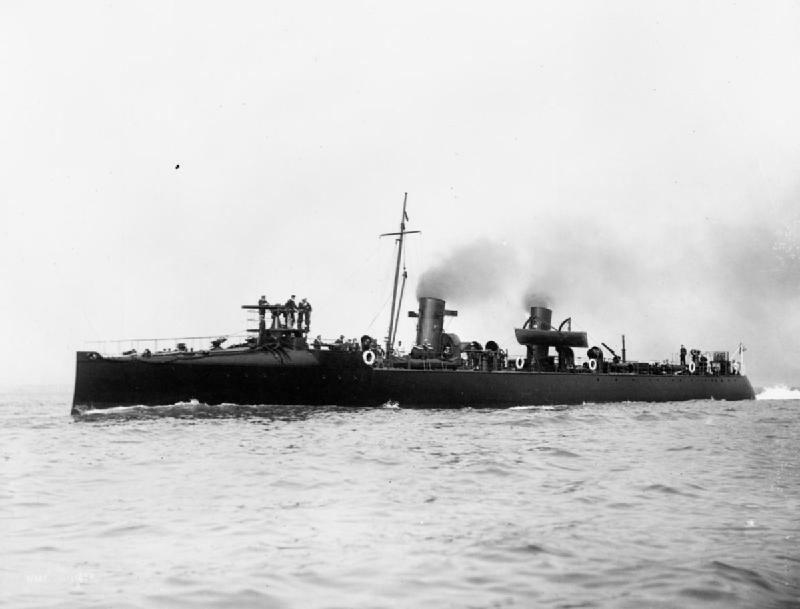 The Ardent class Torpedo-Boat Destroyers were fitted with two torpedo tubes amidships. Their immediate predecessors, the Daring and Havelock classes, had a third torpedo tube mounted in the bow of the ship. This design was subsequently changed when it was found that having fired the torpedo from the bows, the TBD would often overtake the torpedo and risk sinking itself. 1897 [C.8429] Turkey. No. 9 (1897). Reports on the situation in Crete. Rear Admiral Harris to Admiralty. 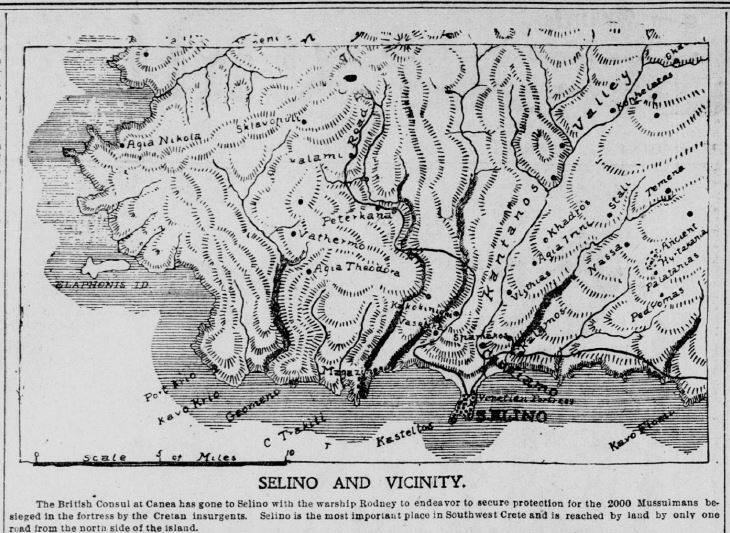 Canea February 24 1897. This entry was posted in Royal Navy in Crete and tagged Cretan blockade 1897, Crete 1897, HMS Bruizer 1897 on September 23, 2018 by Mick McT. The Effects of Shrapnel Shell Fire. During the disturbances in Crete of the last three months I have seen many cases of bullet wounds, chiefly Martini Henry and Chassepot, in the persons of both Greeks and Turks, but have nothing new to remark in connection with these. 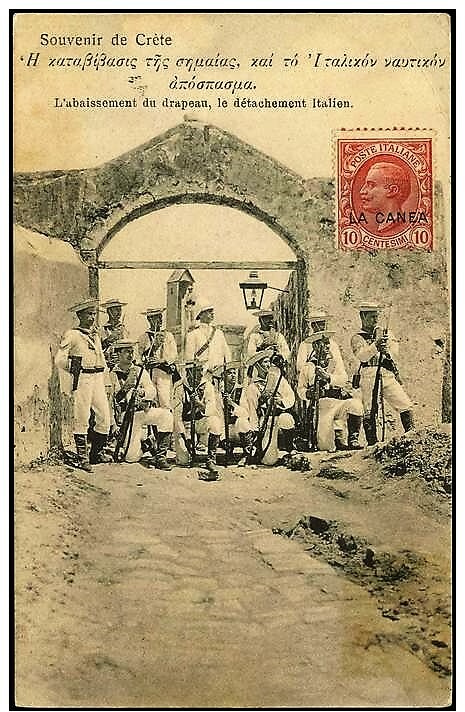 On March 9th the relief of Candamos [Kandanos] was effected by the Powers, and the next day two Turkish outposts had to be relieved; but the position of the insurgents on the hills was so threatening that the ship’s guns were used to disperse them. The same evening I saw the effect of our last shell on one poor man, about seven hours later. He had been brought into Selino [Paleochora] in an unconscious condition, suffering from concussion, a scalp wound over the right supraorbital region caused, I think, by falling on the rocks, a contusion of the back, a flesh wound of the right thigh, and compound fracture of both legs. The wound of the thigh was a contused wound, round, and penetrating all the tissues down to the deep fascia; a probe passed freely in all directions for some 2 inches beneath the superficial tissues. In the right leg there was a small cut like wound, with gaping edges over the crest of the tibia at the junction of the middle and lower thirds, from which there was free venous haemorrhage, and fracture of the tibia at the same site. In the left leg there was a large irregular wound with contused edges at the same level as in the right leg, situated rather to the outer side of the crest of the tibia, and both bones were broken; from this there was also free venous haemorrhage. The shell causing these injuries was a 5-inch shrapnel, Mark iii, fired at a range of 2,500 yards: the shell is charged with 236 round bullets made of 4 parts lead and 1 part antimony, and weighing 14 to the pound. 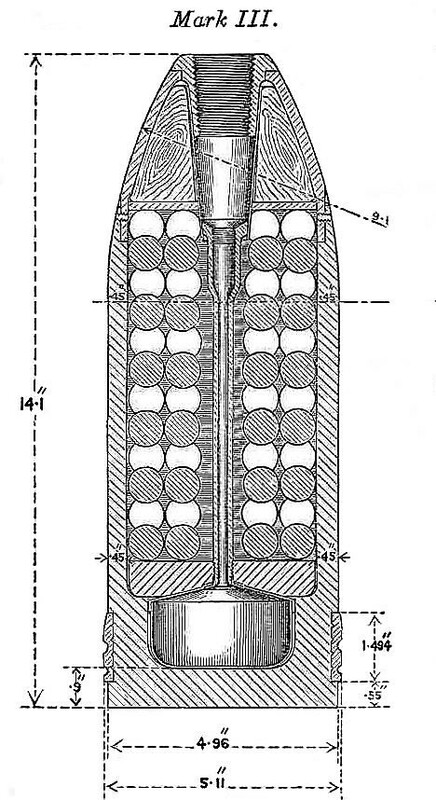 A charge in the base of the shell blows off the head and discharges the bullets in a forward direction. From the shape of the bullets and the nature of their discharge it is of course not to be expected that their penetration would be so great as from a rifle. We were told four men were killed and many injured by our shell fire, and I had arranged to go to Spaniaco [Spaniakos] and Candamos to see them, but the ship was suddenly ordered to join the Admiral at Suda Bay or I should doubtless have had some further observations to make regarding the effects of our shellfire. The events Biden was referring to took place on 10th March 1897 during the evacuation of Cretan Muslims from Kandanos, via Paleochora, by sailors and marines from the European fleet. This entry was posted in Royal Navy in Crete and tagged Crete 1897, European Intervention Crete, HMS Scout 1897, Kandanos 1897, Paleochora 1897, Royal Navy Crete 1897, Surgeon E.J. Biden on September 21, 2018 by Mick McT. In spite of the failure of the Cretan Christians and their Greek allies to capture and hold Fort Malaxa, the insurgents continued to threaten the outposts of Fort Izzedin; the Ottoman fortress that dominated the entrance to Suda Bay, the main anchorage of the European Fleet. HMS Camperdown shelling insurgents above Fort Izzedin; view from HMS Revenge. 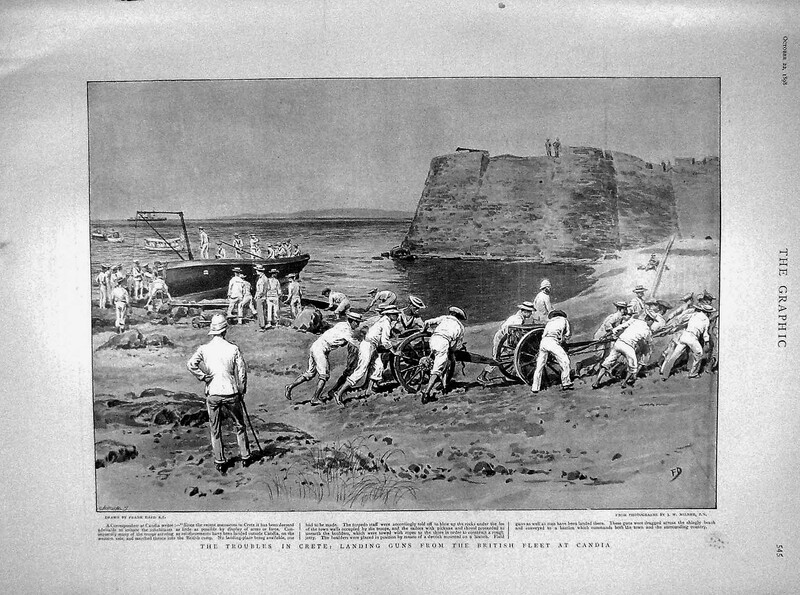 The Turkish garrison in the fort responded with its artillery, and the war-ships in the bay kept up a constant fire upon the besieging forces. At daylight next day the fight was resumed, but the Cretan Christians failed to storm the fort. 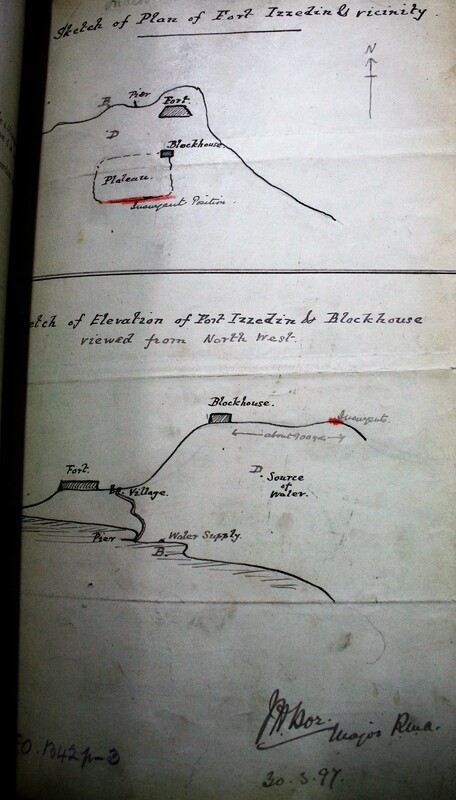 In light of its strategic importance, the blockhouse commanded the water supply to Fort Izzedin, it was eventually determined that the outpost would be occupied by a force from the European Powers under the command of Colonel Bor, Royal Marine Artillery, who, for the purposes of this expedition, was awarded the ‘honorary’ rank of Lieutenant Colonel. 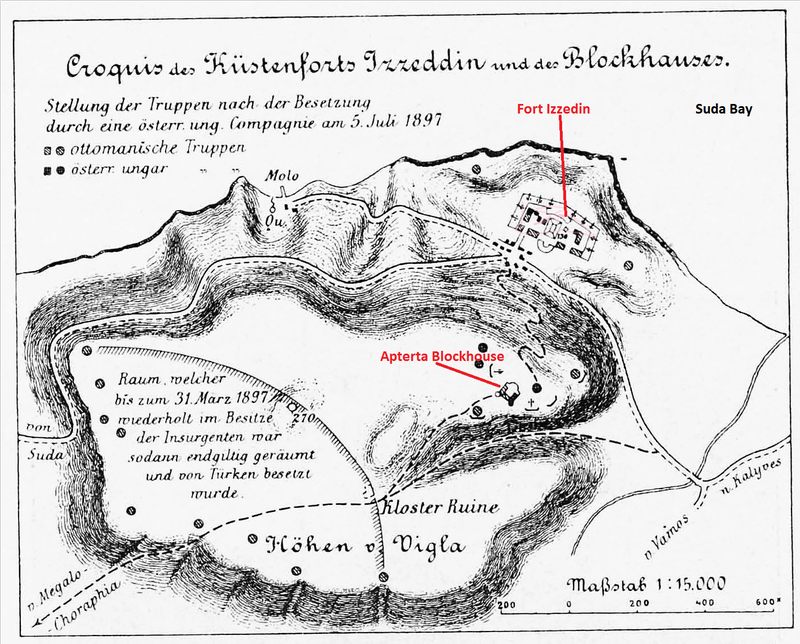 Major Bor’s sketch map of Fort Izzedin and the Aptera Blockhouse. 30 March 1897. 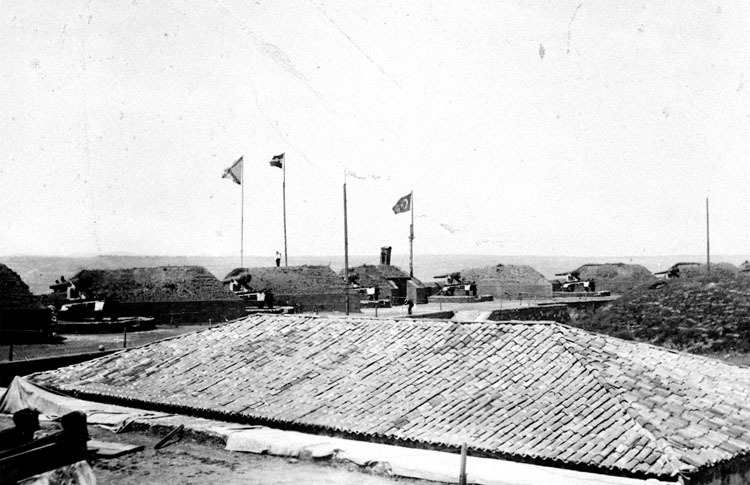 On 18 April at about 6p.m., Bor’s command occupied both Fort Izzedin and the Aptera blockhouse. 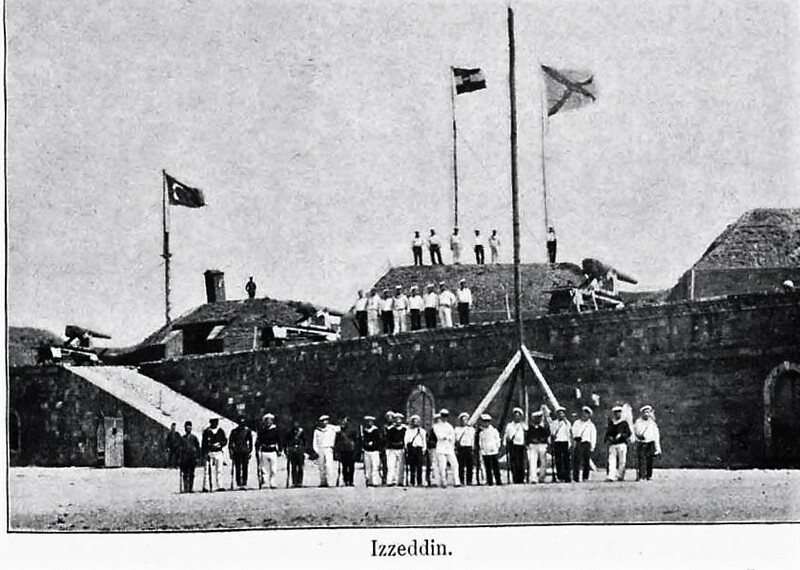 Austro-Hungarian and Russian troops in Fort Izzedin. Bor reported that he placed the Austrian and Russian contingents within the Fort, ordering them to hoist their flags to alert the insurgents to the European presence, while he went with the French and British contingents to the blockhouse; similarly hoisting their respective national flags. Both buildings apparently suffered from bad latrines and the accommodation in the blockhouse was so ‘indifferent’ that the French detachment requested, and were granted, permission to camp outside the building. Shortly after his arrival firing broke out between Ottoman troops and insurgents to the east of the block-house, but following Bor’s instruction to the Ottomans to cease fire, the insurgents also stopped. 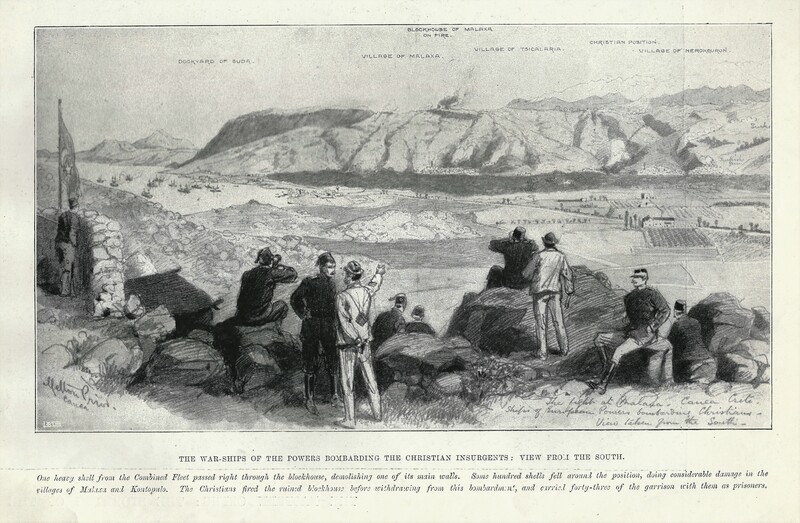 The next morning the insurgents renewed their attack on the eastern outposts and their reinforcements could be seen advancing towards the firing line. 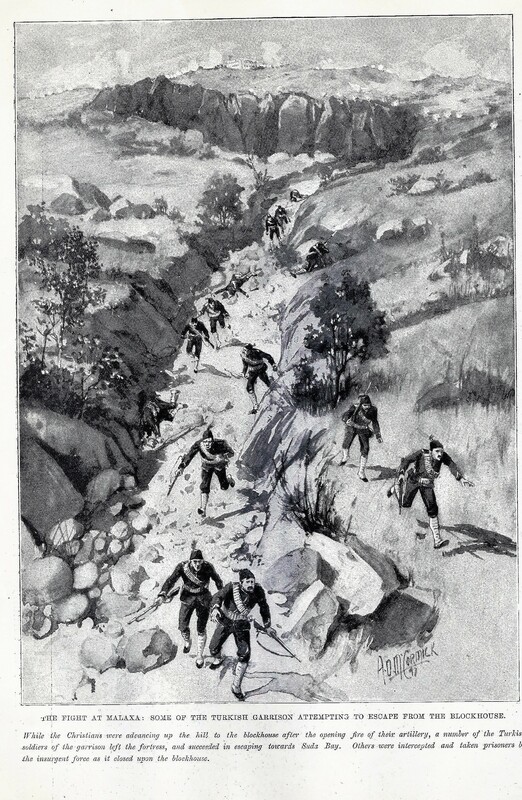 Believing that the Cretan Christians could not see the French and British flags on the block-house from their firing line, Bor “ …marched out the French and British contingents with their flags to a conspicuous place, and, having previously sent to the Turkish outposts to cease firing, […] sounded the English ‘retire’ three times in order to attract the attention of the insurgents. They at once ceased firing and soon afterwards dispersed and went away, leaving slender guards for the rest of the day with two Greek flags which they planted along their line.” For the next few days there was little insurgent activity and the locals resumed working in their fields. On 20th April, a group of 30 or so insurgents approached the abandoned village of Megalo Chorafia and planted a further Greek flag. No shots were fired by either side, and Bor issued strict instructions that the Ottoman and European troops were not to open fire unless a serious attack was threatened. 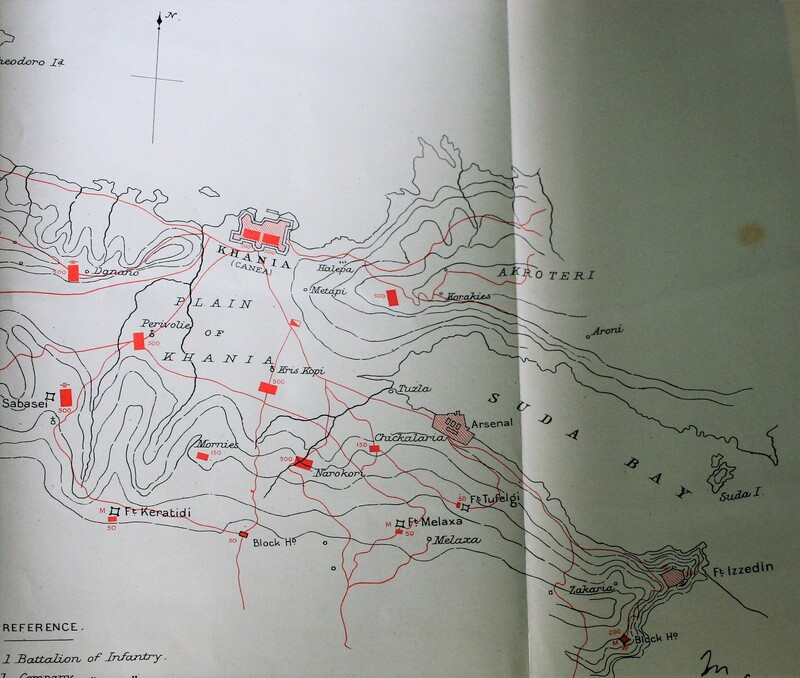 The following day the Greek flags by the eastern outposts disappeared and more people, ‘very few of [whom] are armed’ appeared working in the fields within 1000 yards of the Ottoman lines. There were also indications that a few people were taking up residence in the Megalo Chorafia. “…shortly before 11pm last night the insurgents commenced an attack on the eastern outposts of this position which lasted about an hour and a half and only ceased when some Krupp guns and Nordenfelts came into action from the Fort and Blockhouse. Reinforcements of uncertain strength were at this time coming down the valley as could be seen by a number of lights they were carrying but they had not come under fire when the attacking force fell back. In the meantime another, though lesser, attack had been made on the southern outposts which lasted about half an hour. At one o’clock as all appeared to be over, the garrisons of the Fort and the Blockhouse went to bed but an hour later a second and more determined attack was made on the same outposts and on two of the western outposts. The main attack this time was on the south side where the enemy closed to within 500 yds of the defence but retreated under heavy rifle fire. On the east the attackers were crossing the river in considerable numbers when I again ordered the Krupp and Nordenfelts that side of the Blockhouse to open fire with the result that the attack fell back almost immediately. About 2p.m. nearly all firing ceased and at 2.40 a.m. the garrison again lay down to sleep. Up to 5.30 a.m. occasional shots were exchanged between the outposts and the insurgents by which time most of the latter had got away over the hills out of sight. The total strength of the attacking force must have been at least 300 men and in this was included one company of about 40 men which appeared to be well trained and under good control as I saw it fire repeated good and well timed volleys. Two well trained buglers were also with the force. About 1800 rounds rifle ammunition. There was a great deal of unnecessary and useless firing from the Turkish outposts which I was unable to control personally as I felt bound to remain close to the Blockhouse where the French and English were manning the battlements and which was central. At daybreak I visited all outposts and informed officers and men of the folly of wasting their ammunition. There are no grounds for forming any opinion as to whether the attack will be renewed during the next few nights or not. But the position is quite strong enough even without the from the ships near the coast. 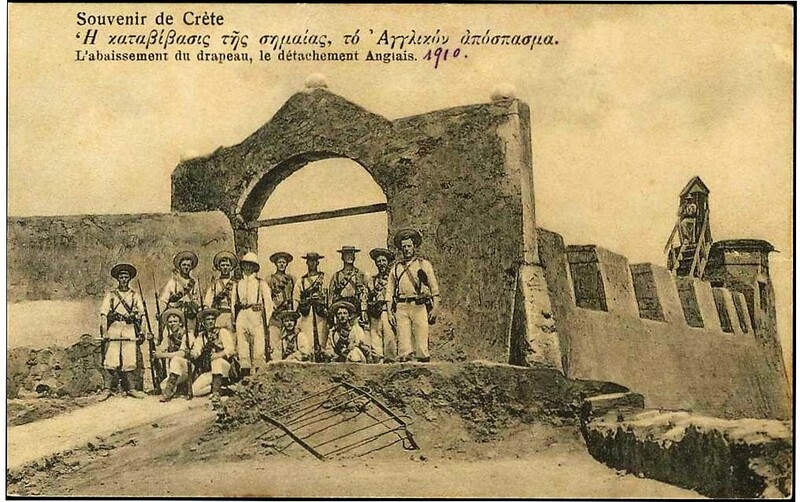 As far as can be determined, this was the last serious attempt by the Cretan Christians to take over the Blockhouse and with the evacuation of Greek troops from Crete in May 1897, the situation quietened down. National Maritime Museum MS86/074 Letter dated 5 April 1897 from Fred (Blomeley?) to his grandmother describing firing on Greek attack on the Aptera outpost of Fort Izzedin. The reference to ‘sinking the Victoria’ relates to the fact that H.M.S. Camperdown had accidentally sunk the battleship H.M.S. 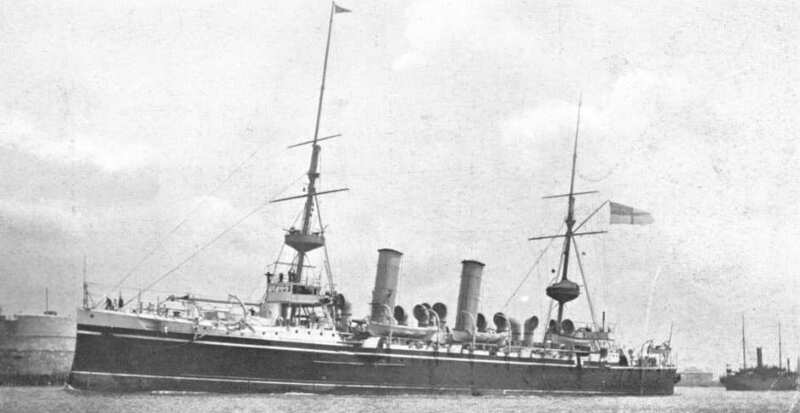 Victoria, while on manoeuvers on 22nd June 1893. National Archives. ADM 116-92. Inclosure 183, Major Bor to Flag captain H.M.S. Revenge. 20 April 1897. National Archives. ADM 116-92. Inclosure 184, Major Bor to Flag captain H.M.S. Revenge. 21 April 1897. National Archives. ADM 116-92. Inclosure 192. Major Bor to Flag captain H.M.S. Revenge. 23 April 1897. 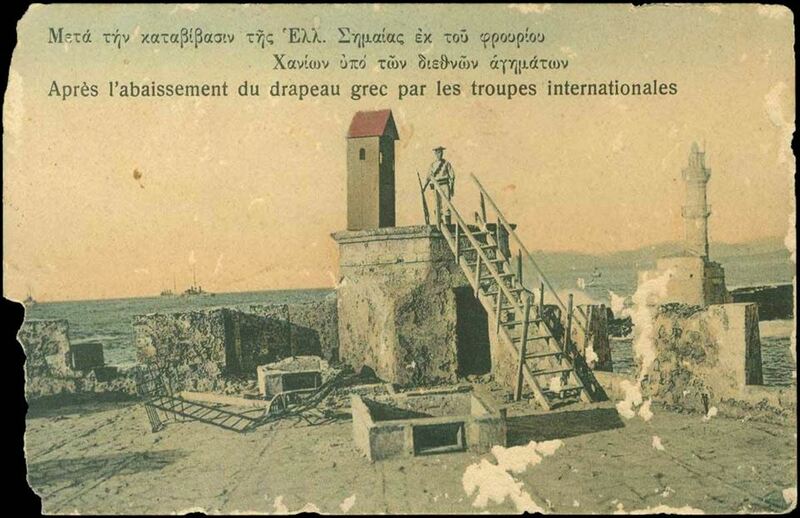 This entry was posted in European Intervention Crete, Royal Navy in Crete and tagged Aptera Blockhouse, Crete 1897, European Intervention Crete, Fort Izzedin, Fort Malaxa, Major Bor, Ottomans in Crete on April 20, 2017 by Mick McT. The battle for the Malaxa blockhouse. In early 1897 one of the few lengths of properly paved road on Crete was the stretch between the then capital, Canea, and Suda Bay, the only large and safe deep water anchorage on the island. Commanding both the road, the main approach to Canea from the east, and the entrance to the harbour, was Fort Izzedin and its associated outworks. British map of Suda Bay, April 1897. 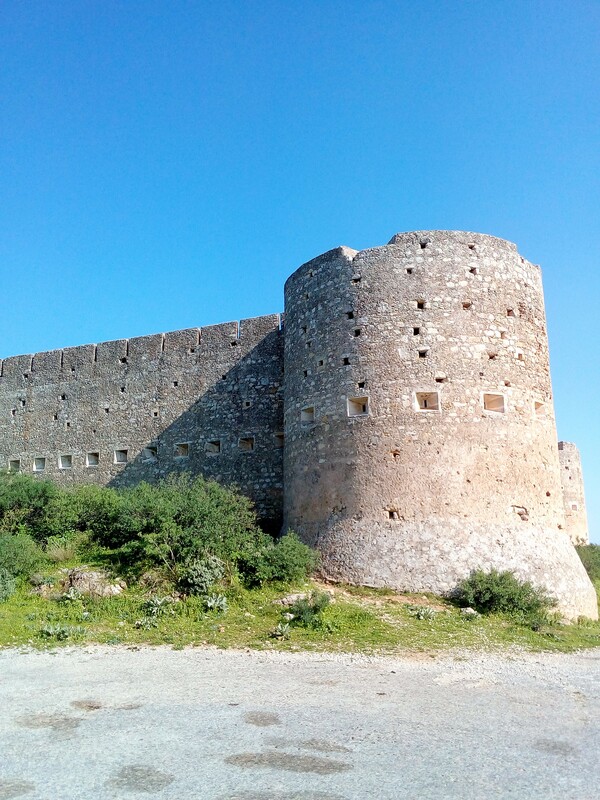 While realistically the Christian Cretan insurgents were never going to be able to take over the Fort Izzedin, the capture and occupation of the outlying blockhouses would put pressure on the Ottoman forces, both within the fort and in Canea. Accordingly, several attempts, some more successful than others, were made to capture these positions. The insurgents were more successful when they attacked again three weeks later. The Illustrated London News drawing is described as being ‘[d]rawn by R. Canton Woodville R.I., from a Sketch by our Special Artist, Mr. Melton Prior’, and has Canton Woodville’s initials on the bottom left hand side and what appears to be an engraver’s mark on the bottom right. The identical illustration published in Le Petite Journal contains no attribution to the artists. 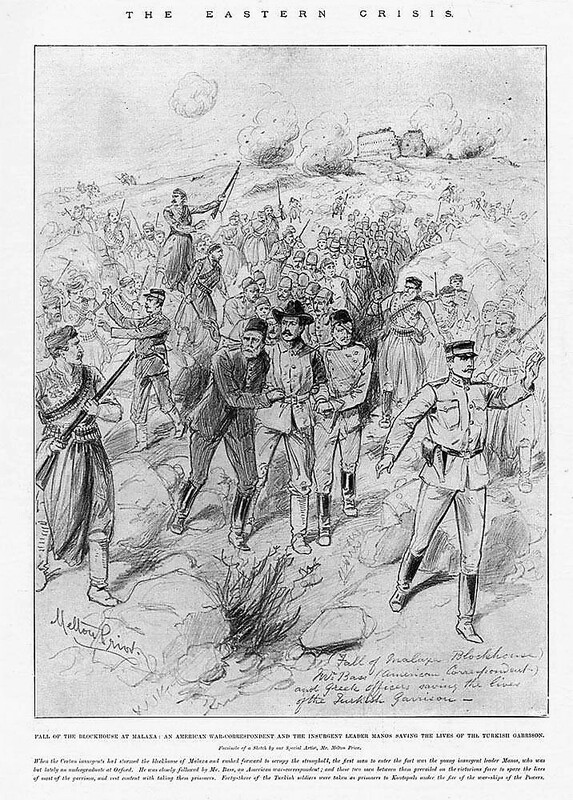 From other contemporary reports in the Illustrated London News it would appear that in addition to the intervention a British educated insurgent, the assistance of an American journalist and a Greek Army officer were instrumental in preventing a massacre of the Ottoman defenders and facilitating the transfer of the Ottoman prisoners to the Greek Army HQ in the nearby village of Alikianos. Not all of the garrison were captured or killed, some managed to make their way down the steep hill-side to safety. 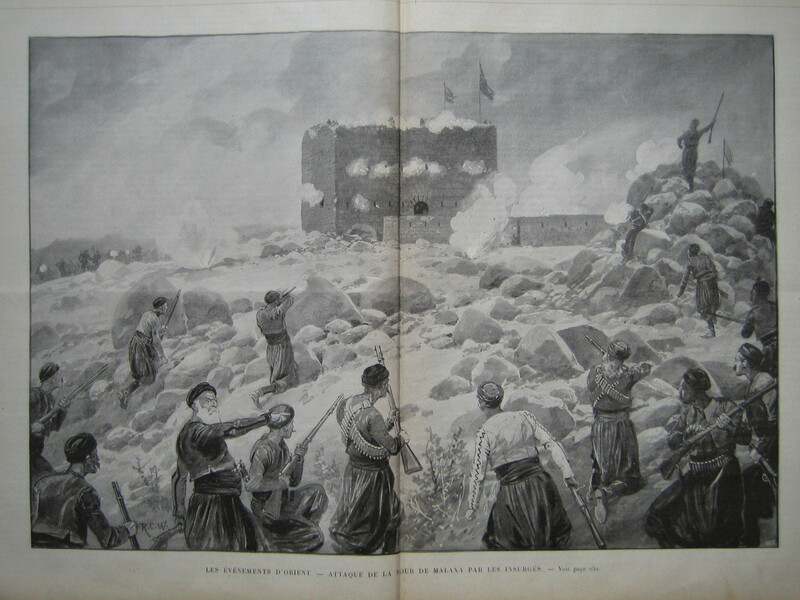 European forces bombard Malaxa Blockhouse. The fall of Malaxa blockhouse. A handwritten note on the illustration describes the figures in the foreground as ‘Turkish troops from roofs of houses in Nerokouron. 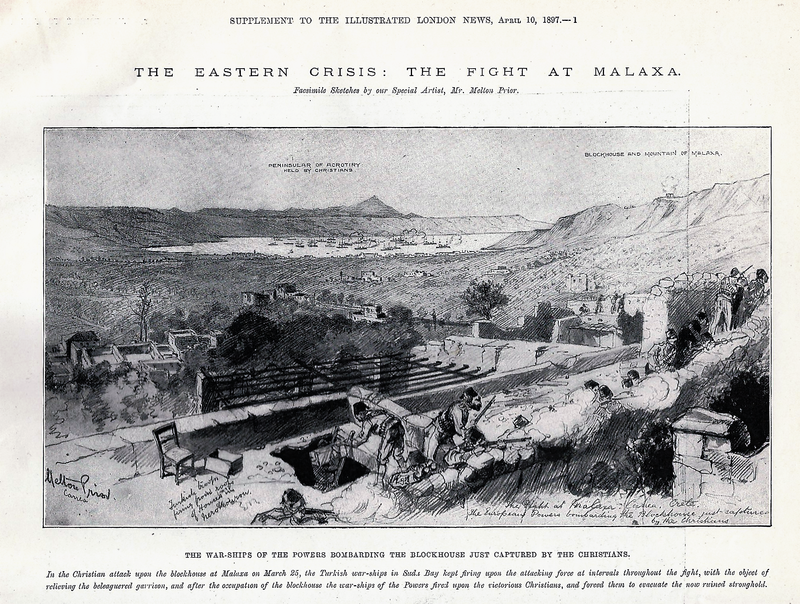 The smoke from the Malaxa blockhouse is shown in the top right hand corner of the illustration. 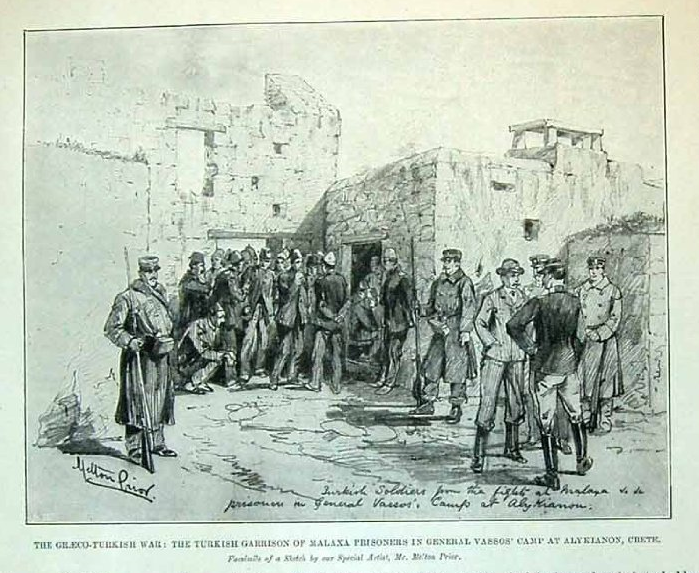 The Ottoman prisoners were taken to the headquarters of the Greek invasion force at Alikianos and kept there until the evacuation of the Greek army a month or so later. The date of the above photograph is unknown and the caption might refer simply to the location of the shot. However, it is possible that it may contain images of some of the Cretan Christians who fought at Malaxa. Command Paper No Turkey No.9, 1897. No1. Admiral Harris to Admiralty, 24 February 1897. 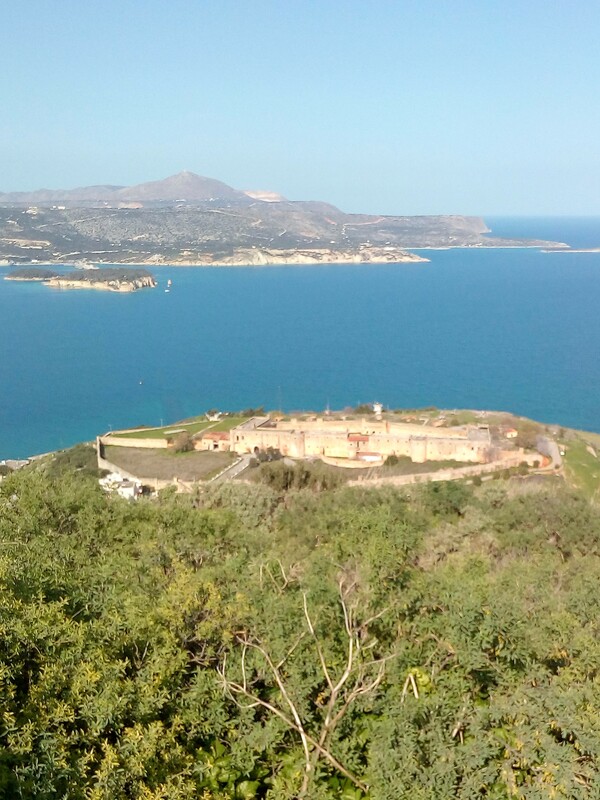 This entry was posted in European Intervention Crete, Royal Navy in Crete, Uncategorized and tagged Crete 1897, European Intervention Crete, Fort Izzedin, Fort Malaxa, Malaxa blockhouse, Ottomans in Crete on April 2, 2017 by Mick McT. Similar instructions were issued by their governments to the naval commanders of the other Powers. 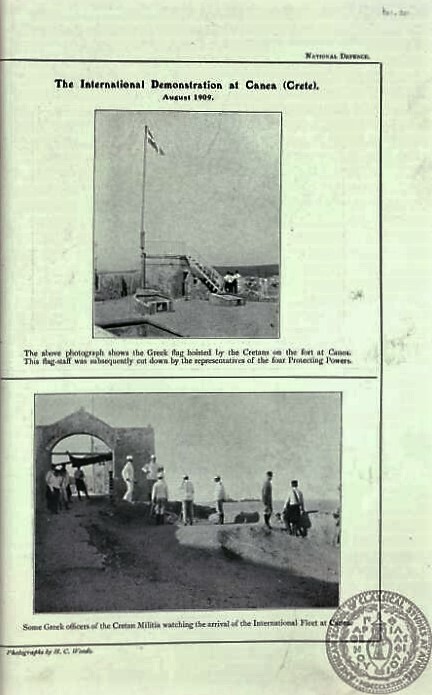 Following the departure of the land forces on the 26th July, as had been anticipated the Greek flag was raised above the Firka (Fortress) in Canea and also in Candia. Greek flag flown over the Firka, Canea 1909. 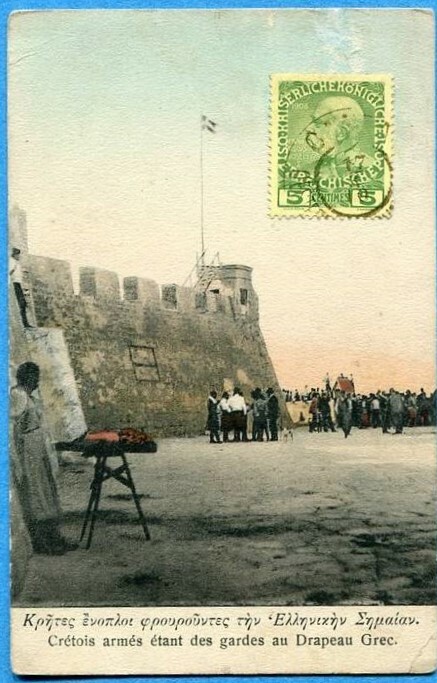 Flags of Powers Fort Suda July 1909. Illustrated London News, 28 August 1909. 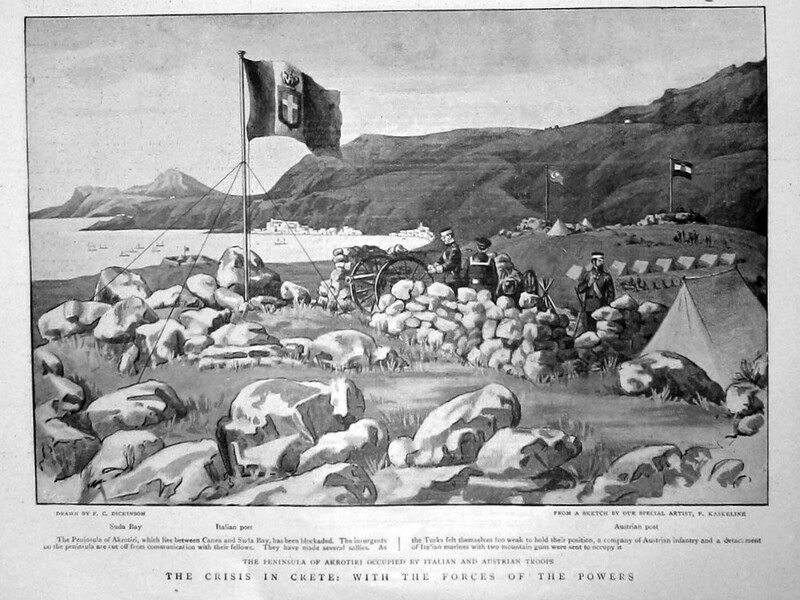 Diplomatic efforts by the Consuls General of the Powers failed to persuade the Cretan authorities to lower the flags and in the face of strenuous Ottoman complaints, and the threat of an Ottoman fleet returning to Crete to enforce the removal of the Greek Flag, the Powers agreed to take the matter in hand. On 15th August Captain Cecil Thursby, H. M. S. Swiftsure, arrived off Crete and the following day, as Senior Naval Officer in Cretan waters, assumed command of all the Powers’ ships. An unsuccessful attempt had been made that morning to lower the flag in Canea but the gendarmes given the task had withdrawn in the face of armed Cretan Christian opposition. 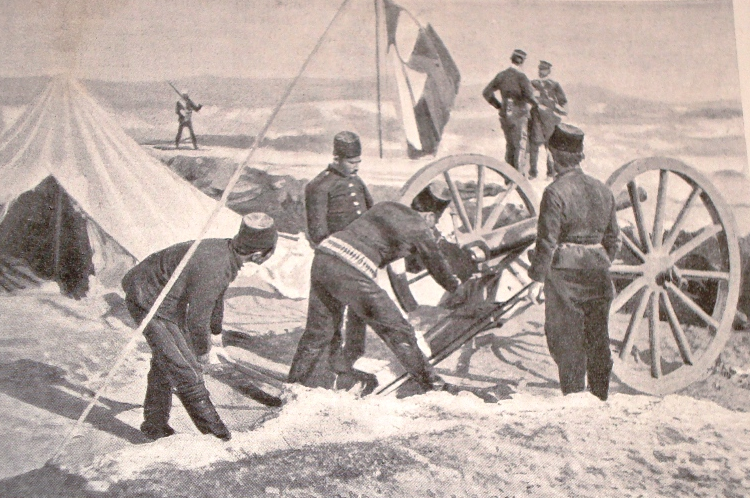 Having discussed the situation with his naval counterparts and with the Consuls General, Thursby ordered that the flag in Canea would be removed, by force if necessary. The Firka. Before and after the Greek flag was flown. HMS Diana in the offing. After about half an hour, there being no reaction from the town, the landing parties were withdrawn, with the exception of a party left to guard the remains of the flagpole. International force at the Firka, Canea. August 1909. British contingent at the front on right. The Firka, Canea, after the flagpole removed. 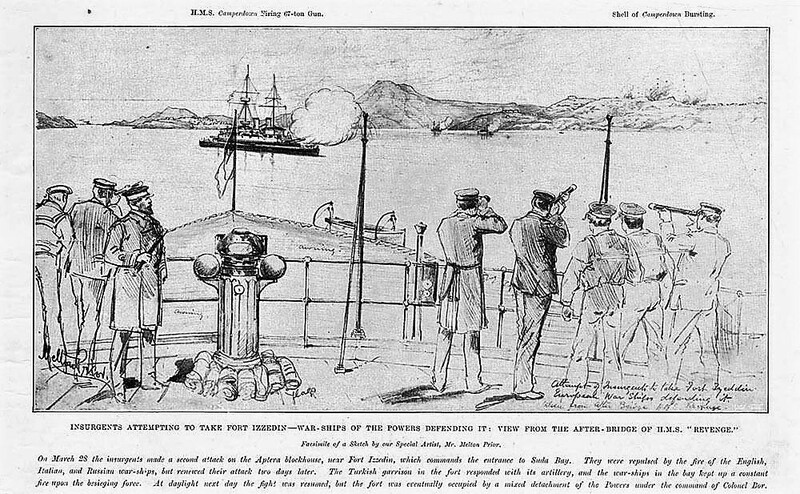 British guard party at the Firka, Canea, after flagpole removed. 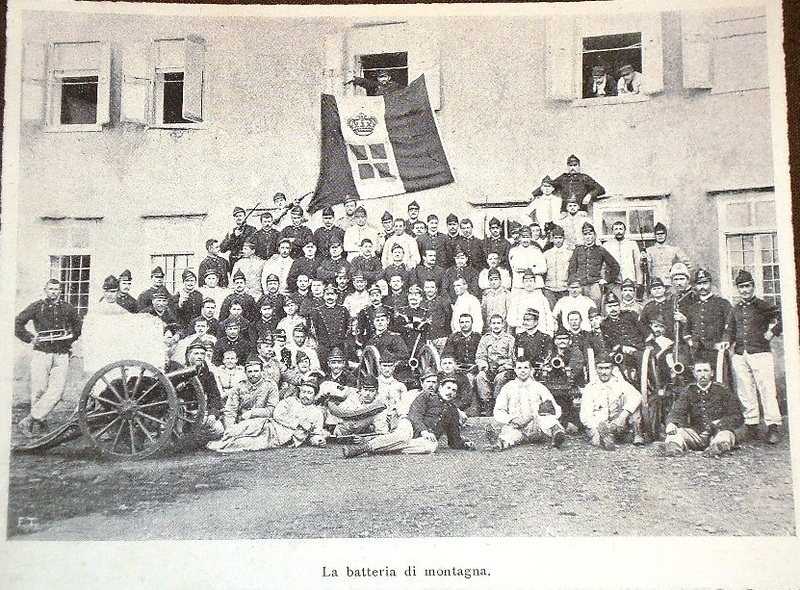 Italian guard party at the Firka, Canea, after the flagpole removed. Cretan gendarmarie guard party at the Firka, Canea. Meanwhile, in Candia, the Greek flag had also been raised; only to be lowered after the Power’s actions in Canea, and then raised again. It was finally lowered for good when Captain Thursby made it clear to the Cretan Assembly, via the Consuls General, that the combined naval forces under his command were quite prepared to use force to remove the flag. In the end, the remains of the flagpole in Canea remained under International guard until 1st September when Thursby and his colleagues came to the conclusion that their point had been made sufficiently forcefully, and the detachment was withdrawn. 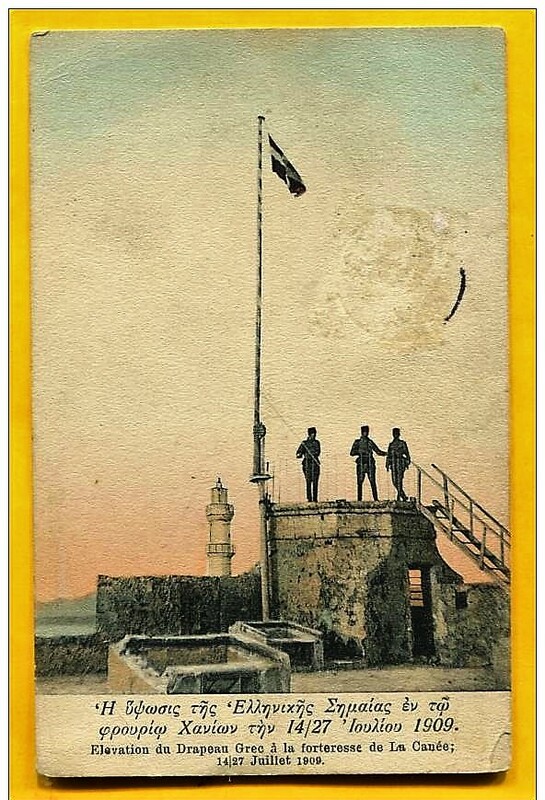 The next time the Greek flag was flown on Crete, at least semi-officially, was on 13th February 1913 when the Ottoman flag was removed from it’s last flying place on Suda Fortress by the crew of H. M. S. Yarmouth. 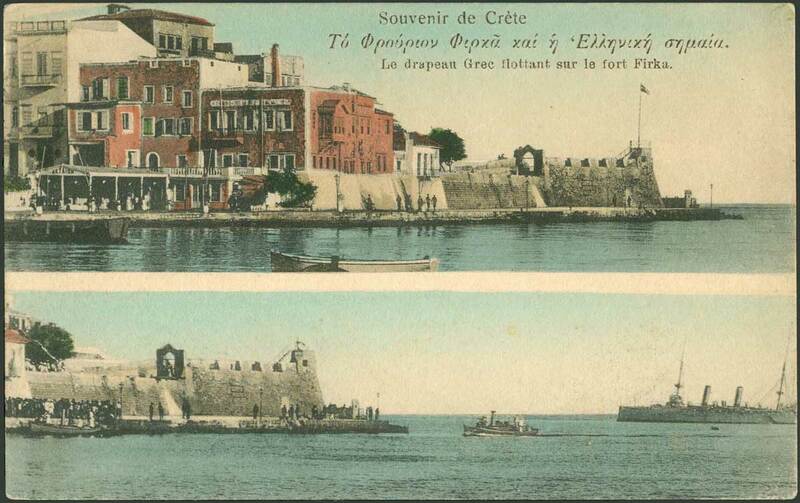 The first time it was ‘legally’ flown was on 1st December 1913 when, at a ceremony on the Firka, Crete formally became part of Greece. Foot Note. That the matter of whose flag should be flown was a serious one is shown by the fact that when the Greek flag was raised in July 1909, the Ottoman empire threatened to send forces to remove it; a threat which was taken sufficiently seriously for Captain Thursby to draw up instructions for the ships of the Powers under his command, making it clear that any attempted Turkish landing would be forcibly opposed. National Maritime Museum NOE 10/1. Admiralty to Rear Admiral ‘Duncan’ Canea. This and subsequent details of the operation in National Maritime Museum NOE 10/1. Ships Copy of Reports of Proceedings Nos 1,2 & 3. 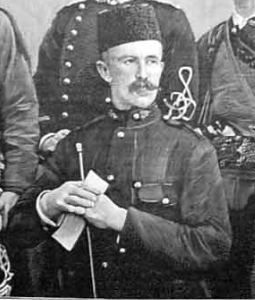 Captain Cecil Thursby. 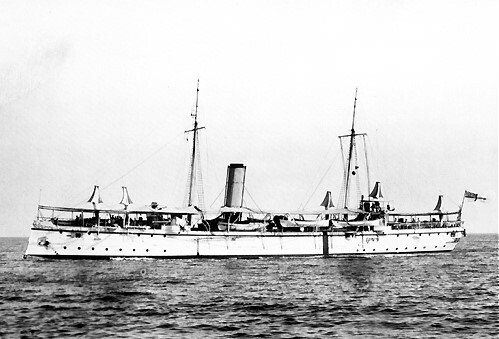 H, M. S. Swiftsure, Canea to Senior Naval Officer Malta. This entry was posted in European Intervention Crete, Royal Navy in Crete, Uncategorized and tagged Canea 1909, Captain Cecil Thursby 1909, Crete 1909, European Intervention Crete, Firka Canea, Greek Flag Crete 1909, H.M.S. Swiftsure 1909, International Fleet on August 18, 2016 by Mick McT. Towards the end of 1911 Cretan and Greek politics were in somewhat of a turmoil … plus sa change. 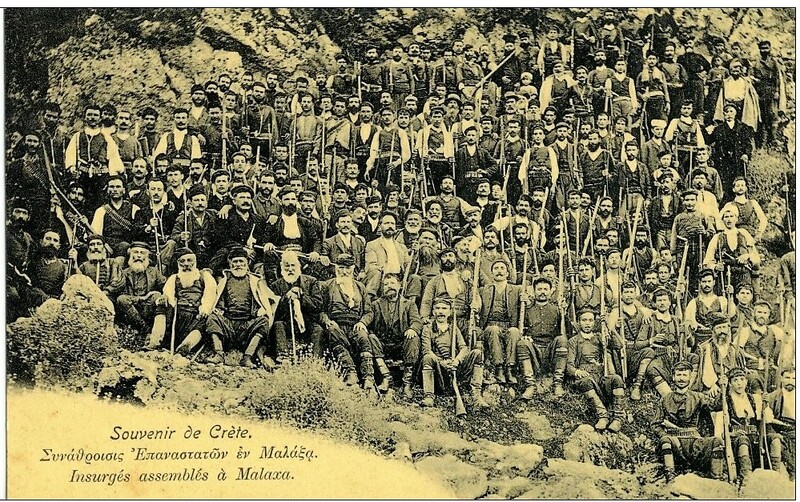 Cretan Christians were agitating for enosis, and insisting that they be allowed to send the Christian deputies elected to the Cretan Assembly to the Greek parliament – a move which would have created a casus belli with the Ottoman Empire, and the last thing either the Cretan- born Greek Prime Minister Eleftherios Venizelos or the European Powers wanted, or, in the case of the latter, were prepared to tolerate. While Venizelos was prepared, in spite of the obvious political difficulties, to bar the Cretans deputies from taking their seats in the Greek parliament, with Italy effectively at war with the Ottoman Empire following the Italian seizure of Tripoli (Libya), it was left to the three remaining Powers, Britain, France and Russia, to assure the Porte that Cretan deputies would not be allowed to leave Crete. Accordingly, in December 1911, a group of Cretan deputies, en route for Greece, were intercepted and detained by the Powers. 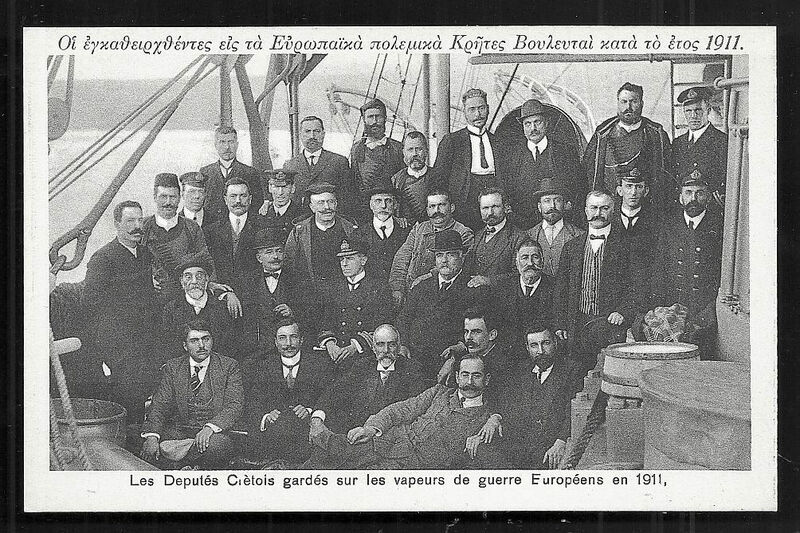 Cretan delegates on board French war ship, 1911. Probably H. M. S. Minerva. 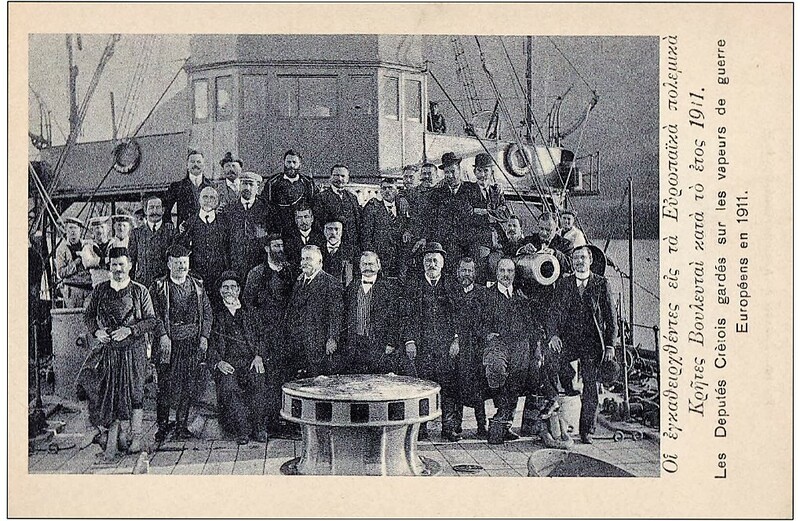 Cretan deputies on board European ship 1911. Probably H. M. S. Minerva. *In an apparent attempt to keep Greece out of the War, the Ottoman Empire not only did not declare war on Greece when doing so on Bulgaria and Serbia on 17th October 1912, but also offered to abandon its claim to Crete if Greece stayed neutral…a case of too little too late. Capt. Hyde Parker (Senior Naval Officer, Crete) to C-in-C Med Fleet, 16. Feb. 1912, FO371/1352. Quoted in: Holland R. and Markides D. The British and the Hellenes. Struggles for Mastery in the Eastern Mediterranean 1850 – 1960. OUP. p.154. Lord Grey minute, 20 Oct. 1912, Fo371/1358. Quoted in Holland R. and Markides D. The British and the Hellenes. Struggles for Mastery in the Eastern Mediterranean 1850 – 1960. OUP. p.157. 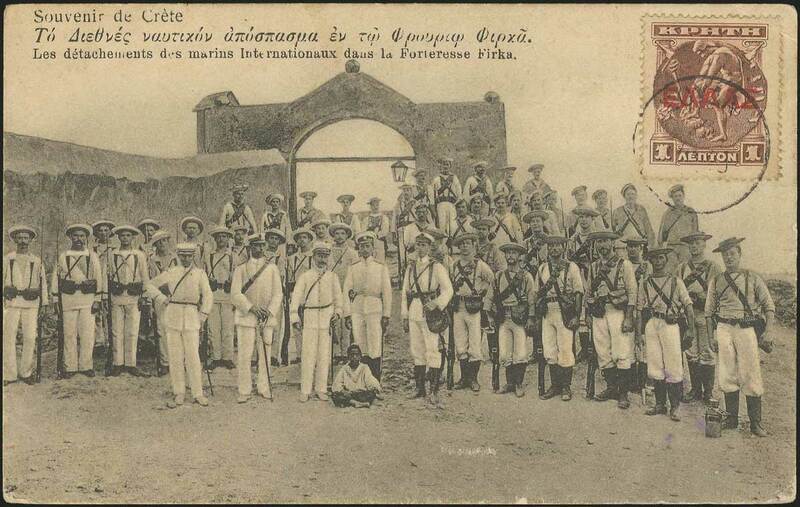 This entry was posted in Cretan Rebels, Enosis, European Intervention Crete, Royal Navy in Crete, Uncategorized and tagged Cretan Deputies 1911, European Intervention Crete, H.M.S. Minerva on August 3, 2016 by Mick McT.